Is There a Bullish Breakout for the Gold Miners ETF – GDX? Gold mining stocks and the gold mining sector as a whole have been in free fall mode since September 2012. The Market Vectors Gold Miners ETF (GDX) is still trading 55% below its peak, but it is showing signs of life. Is this a bullish break out? The March 6, iSPYETF article on ‘Gold vs GDX’ mercilessly ousted the fundamental profit making flaws of the gold mining sector. To say that gold mining stocks have had a hard time monetizing their mining activity in an environment of falling gold prices is like claiming hurricane Sandy was just a stiff breeze. The Market Vectors Gold Miners ETF (GDX) lost 60.8% from top to bottom tick, but if there’s anything we’ve learned from QE is that what comes down likely goes back up. 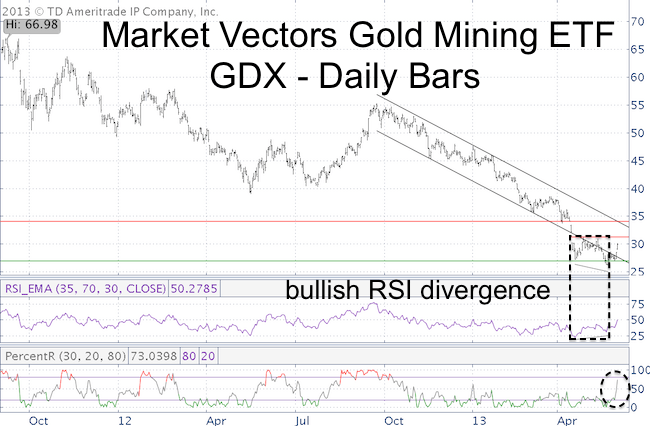 Based solely on technical analysis, GDX just completed the first steps of a bullish breakout. The May 20 low has three trademarks of a tradable bottom. It sports a bullish RSI divergence where price dropped to a new low, but RSI did not. Prices were able to close above the black parallel channel that confined much of the previous down trend. Thursday’s pop canceled a bearish percentR low-risk entry. percentR (or Williams %R) is a momentum indicator. According to my personal methodology (which is correct about 60 – 70% of the time) the immediate down trend is now broken. It obviously will take more confirmation for the fledgling breakout to ‘stick,’ but the above-mentioned bullish factors decrease the odds of being cut by trying to catch a falling knife. A close above the first red resistance line at 31.27 will be further confirmation that a tradeable low is in while key support is located right around 27. Use illustrated support/resistance levels to spot low-risk entries. Low-risk entries are not no-risk entries. But going long against support, or once resistance is broken (and then used as support and foundation for a stop-loss level), significantly limits your risk and lets you know exactly when you’re wrong. Currently prices are 5%+ away from support or resistance. Using support at 27 as stop-loss, the risk (drop from 29.40 to 27) is 8.2%. It makes sense for prices to pull back or resistance to be taken out for a lower risk entry. The Profit Radar Report specializes in pinpointing low-risk entries for the S&P 500, Nasdaq-100, euro, dollar, gold, silver and 30-year Treasuries. There’s always an opportunity somewhere, and the Profit Radar Report helps you find it. 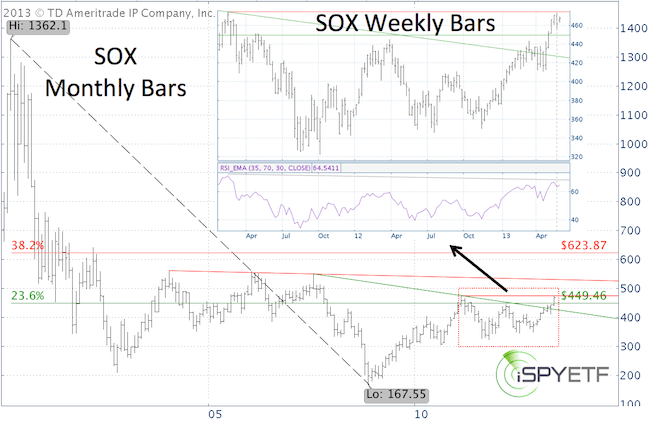 Weekly ETF SPY: Semiconductor Index – Best Reflection of US Economy? Since the 2008 low, the semiconductor sector outperformed the S&P by a sizeable margin. Despite a 5-year winning streak, semiconductors trade a 190% gain away from the 2000 high and might be the most accurate reflection of the U.S. economy. There are always three sides to an argument: your side, my side and the truth. There are also three sides to market analysis: A bullish spin, a bearish spin and the objective take. The bullish spin on the semiconductor index emphasizes the 180%+ rally from the November 2008 low. The bears will argue that the semiconductor sector is still a 190% gain away from its 2000 high and would have to double twice to reach new all-time highs. Fact is, the PHLX Semiconductor Index (SOX) barely retraced more than a Fibonacci 23.6% of the points lost from 2000 – 2008. Compared to other indexes, even technology indexes, that’s quite pathetic. The PHLX Semiconductor Index still trades below its 2007 and 2011 high. In fact, last week prices were rebuffed by the 2011 high. Bearish RSI divergences alone do not consistently foreshadow price highs, but meaningful price highs are generally accompanied by bearish RSI divergences. Semiconductors’ trouble to surpass the 2011 high and a daily and weekly red reversal candle emphasize the bearish undertone of the RSI divergence. The path of least resistance for the coming weeks is down. Support is at 449 and resistance at 475. The SPDR S&P Semiconductor ETF (XSD) tracks an index similar to the PHLX Semiconductor Index. The UltraShort Semiconductors ProShares (SSG) aims to deliver 2x daily inverse performance of the semiconductor sector, but trades on very low volume. The Direxion Daily Semiconductor Bear 3x ETF (SOXS) trades on more volume, but is 3x short. If you don’t want to miss future editions of the Weekly ETF SPY, >> sign up for our FREE Newsletter. Buying climaxes are at the highest level since April 2010. The April 2010 highs were closely followed by the May ‘Flash Crash.’ Are the current conditions similar to 2010 and should we be concerned about a ‘Flash Crash-like’ event? There were 864 stock buying climaxes last week. What is a buying climax and why is that significant? Buying climaxes happen when a stock (or index) makes a 12-month high, but closes the week with a loss. They are a sign of distribution and indicate that stocks are moving from strong hands to weak ones. 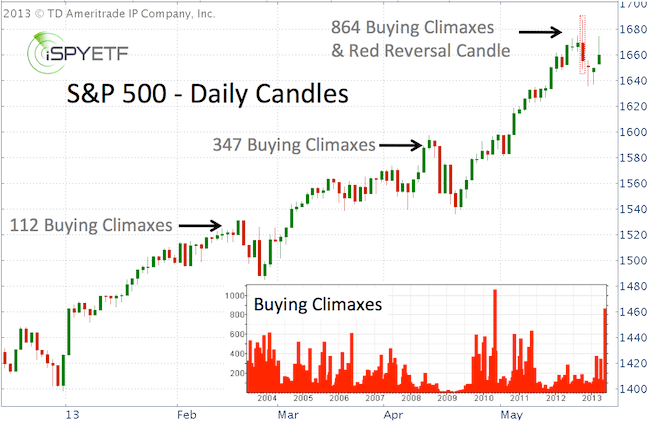 iSPYETF previously pointed out elevated buying climaxes in articles published on February 13 (112 buying climaxes) and April 10 (347 buying climaxes). Both instances were followed almost immediately by corrections (see chart). Last week’s number of buying climaxes – 864 – eclipses the 112 and 347 climaxes seen prior to the February and April corrections. In fact, the current reading is the second highest total since 2004 and is surpassed only by the 1,079 buying climaxes in the week of April 30, 2010 (see chart insert). Does that mean another ‘Flash Crash’ event is around the corner? Current conditions aren’t as extreme as they were in April 2010, but they should be of concern to investors, nonetheless. It doesn’t take a ‘Flash Crash’ to hurt a portfolio. A slow and determined correction can do the same thing ‘Chinese drip torture-style,’ – slower, more painful, but with similar results. Like in 2010, it will take a ‘watershed’ event, a decline that spooks enough investors, to get the ball rolling. A break below important support will likely be just such an event. The Profit Radar Report already pinpointed the must hold support level that – once broken – will lead to lower prices. The S&P/Case-Shiller Home Price Index of 20 big metropolitan areas rose a seasonally adjusted 1.1% from February to March and 10.9% year-over-year. This is the largest monthly gain since April 2006. This is great news, but ‘old’ news. What happened in March doesn’t tell us about the future. Here’s what can. The largest gain for home prices in seven years is reason for cheer, but will the trend continue? Is it possible to turn the lagging S&P/Case-Shiller Home Price Index into a leading indicator for the real estate market? The S&P/Case-Shiller Home Price Index is one of the most popular and most widely accepted gauges for real estate prices, but it is not a leading (as in projecting future prices) indicator. In fact, the S&P/Case-Shiller Home Price Index is calculated using a three-month moving average (the averaging methodology is used to offset delays that may occur in the flow of sales price data) and is published with a two-month lag. Today’s brand new S&P/Case-Shiller Home Price Index readings covers data from January – March 2013. So data is delayed and represents a snapshot of the past with no influence on future prices. It’s a classic lagging index. How can you turn a lagging index into a leading index? 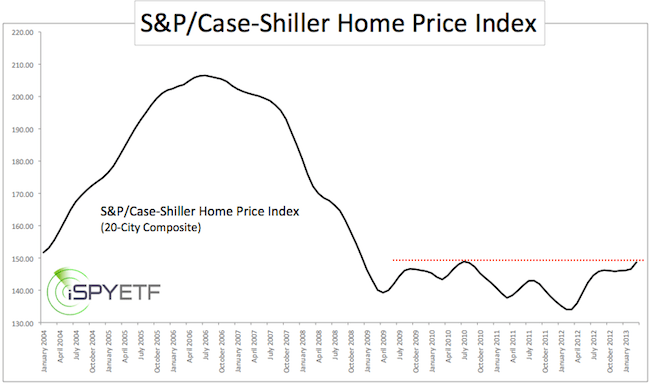 One method we’ve used successfully in the past is to ‘enhance’ the rear-view mirror message of the S&P/Case-Shiller Home Price Index with the predictive qualities of lumber prices. This is not an exact science, but lumber prices tend to set the rhythm for home prices. This makes sense; after all lumber is the key ingredient for every residence. Previous analysis of this correlation in October 2012 and March 2013 suggested higher real estate prices. The chart below plots the price of lumber against the PHLX Housing sector. Lumber prices are set forward by 14-months to express the ‘crystal ball-like’ properties of lumber. Lumber prices soared 53% from September 2012 to March 2013. 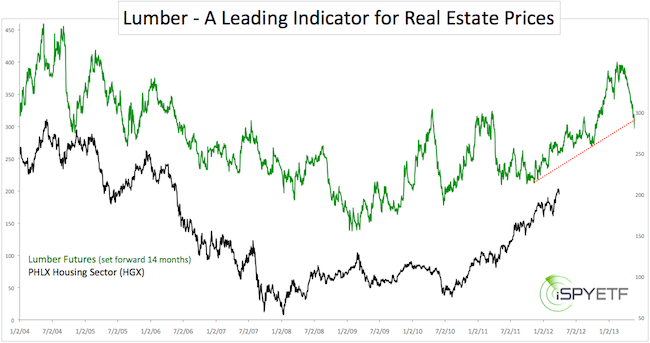 The strong real estate performance is therefore no surprise and according to lumber, more gains are ahead for housing. But over the last two months lumber prices have dropped 32%. Lumber’s wild 53% gain and 32% drop are not yet reflected by the housing sector index. The correlation between lumber and the housing sector is not perfect, but it should cause some ripples for the housing market soon. It will be interesting to see if lumber prices peaked for good or just entered a correction. A permanent peak for lumber could translate into a 2014 top for real estate and opportunities for real estate ETF investors. Will ‘Sell in May and Go Away’ Come Late? About a month ago we asked if sell in May and go away came early? At the time it appeared like it did … but ultimately ‘buy in May like there’s no tomorrow’ is what happened. Does that mean that all risk has vanished or will June be the month of heavy blows? How has the pattern and connected trade played out? Is the 2013 edition of ‘Sell in May’ a no show or is it just delayed? Below is an updated version of the chart featured in the April 17, “Did ‘Sell in May and Go Away’ Arrive Early” article. · The sell in May pattern is obvious. · The sell in May pattern is perhaps too obvious to come true. · The S&P 500 has to move above und subsequently below 1,593 to trigger a sell signal (sell signal triggered on April 11 – see red circle of chart insert). · The sell in May high tends to appear as a double top. Therefore short positions were closed at 1,540 and 1,560. · The move above 1,597 voided the sell in May pattern. Overall seasonality (seasonality based on each year since 1950) shows weakness right around May 1. Post election year seasonality (seasonality based on each post election year since 1950) points to weakness at the end of May. 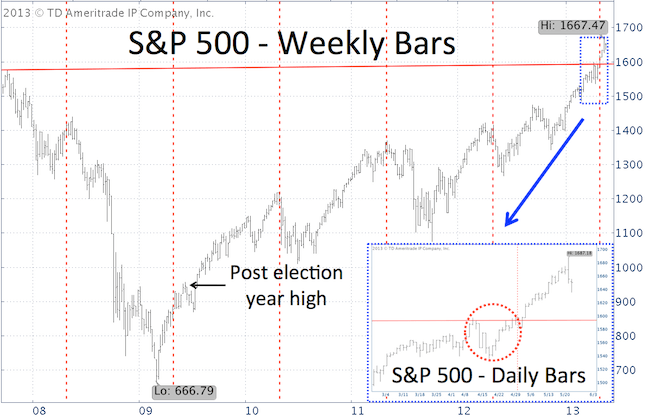 The last post election year – 2009 – saw a high in early June followed by a brief correction and continuation of the rally. 2013 may also see a high according to the post election year seasonality cycle. 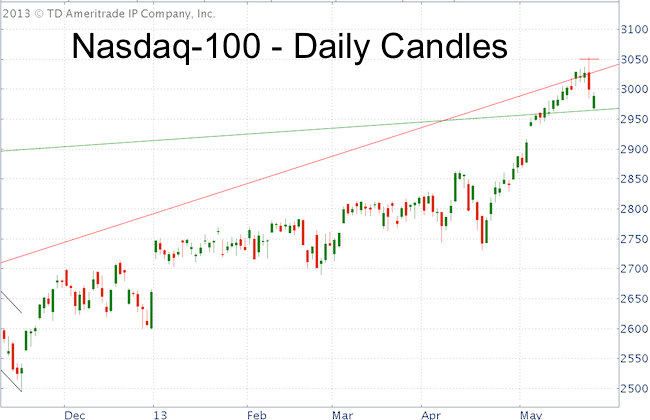 Wednesday’s across the board reversal and the associated reversal candles for all major indexes suggest that the top tick has already been seen. Overheated sentiment gauges point to a correction that will be deeper than the 2009 hiccup. To summarize, based on sentiment and seasonality the conditions are ripe for a correction. However, we need to see a technical breakdown below support or a move to re-test resistance before getting a low-risk entry to go short. According to technicals, the odds for any top to be a major market top are low. Yesterday’s Weekly ETF SPY highlights the precise support/resistance levels used to identify low-risk entries for the Nasdaq-100. The stock market sold off sharply right as Mr. Bernanke spoke before Congress, but there were other – more predictable reasons – for stocks to fall: Sentiment, seasonality and technicals. Here’s the technical analysis that kept investors ahead of the trend. On April 24, the S&P 500 broke above its all-time high at 1,576. 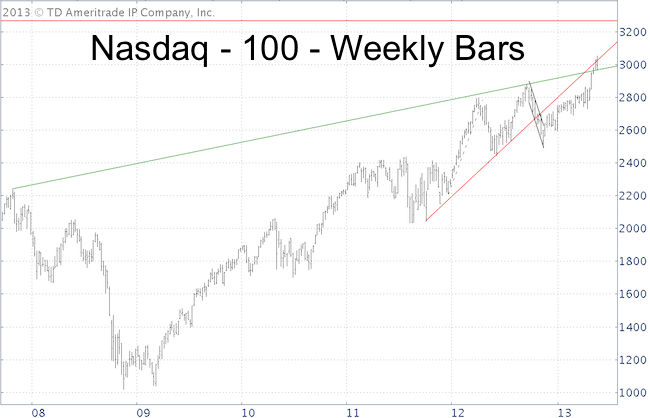 Since then the Profit Radar Report analysis has been focused on the Nasdaq-100. Why? Unlike the S&P, the Nasdaq-100 (and its corresponding ETF, the PowerShares QQQ) trades well below its 2000 high. There are fewer resistance levels for the S&P 500 – an index trading at all-time highs – compared to the Nasdaq-100. The weekly chart below shows the two trend lines we’ve been focusing on. The green trend line goes back to 2008 and is key support. The red trend line served as initial target and now early warning indicator. 1) It’s a reversal candle that engulfs the four prior candles and occurred right against the long-term trend line as well as short-term resistance at 3,050. Reversal candles are not foolproof. For example, a reversal candle for the Dow on February 25 did no lasting damage. But unlike the Dow’s February 25 candle, yesterday’s reversal was the common denominator of all major markets. We looked at the Nasdaq-100 because it gives us the support/resistance levels needed for risk management and low-risk buy/sell triggers. Let’s take advantage of them. Prices often retest a previously broken support level, so a move up to the red trend line would be a low-risk opportunity to go short. A stop-loss should be used as a move above the red trend line would point to a continuation of the rally. Selling tends to accelerate when support is broken (this was true with the red trend line). Therefore, a move below the green trend line would unlock lower targets. Based on past experience, stocks should bounce to digest yesterday’s decline. There’s an open chart gap for QQQ at higher prices. At least that chart gap should be closed. This week’s ETF SPY is more ‘special’ because it includes information generally reserved for subscribers to the Profit Radar Report. >> Sign up for the Profit Radar Report if you’d like to enjoy this kind of analysis. Did you know that Isaac Newton was the London gold mint master and set the price of gold? Did you know that the U.S. government can and has confiscated physical gold? Is now the time to buy? Here’s what you should know if you’re thinking about buying or selling gold? If you are reading this article there’s a good chance you’re thinking about buying or selling gold. Before you trigger the trade, take a moment to learn about the ‘stuff’ you’re about to buy/sell. There are a lot of interesting little-known facts that may influence your decision. The earliest recorded usage of gold dates back as far as 3000 BC, when Egyptian civilizations used gold for jewelry and decorative objects. Around 1500 BC, gold became a currency for international trade. The first minted gold coin on record was produced in Asia Minor about 560 BC. In 1284 AD, the Republic of Venice introduced the gold ducat (called Zecchino), which soon became the most popular coin in the world. In 1717, Isaac Newton (master of the London gold mint dating back to 1699) set the price of gold, which lasted for the next 200 years. The Coinage Act of 1792 placed the United States on a silver/gold standard. In 1900, congress enacted the Gold Standard Act, which required the U.S. Treasury to maintain a minimum gold reserve of $150 million. This meant that dollars could be converted into gold at any time. Currency based on the gold standard represented real value since, unlike paper currency, gold is not someone else’s liability. Gold’s value is established by the willingness of people to pay a specific price. In 1933, President Roosevelt took the country off the gold standard, which allowed the government to print the money needed to deal with the aftermath of the 1929 – 1932 decline. Two years later, FDR fixed the price of gold at $35/oz. The gold standard was restored to some degree via the Bretton Woods Agreement (BWA) made in 1944. The prominent features of the BWA were an obligation for each member country to adopt a monetary policy that maintained the exchange rate of its currency within a fixed value in terms of gold. The International Monetary Fund (IMF) was established to bridge temporary imbalance of payments. The United States rejected the idea of a supranational currency (called bancor) and requested to make the U.S. dollar the default reserve currency. The request was granted and the greenback overtook the role gold should have played. To bolster faith in the dollar, the U.S. agreed to link the dollar to gold at the rate of $35/oz. At this rate, foreign governments and central banks (not U.S. citizens) were able to exchange dollars for gold. A two-tiered price system for gold was established in 1968. The first tier was for transactions between governments, pegged at $35/oz, while other transactions (the second tier) would be supply/demand driven. The expected price range for second tier transactions was between $35 and $50/oz. BWA remained in force until 1971. After a big drop in U.S. gold reserves and a large increase in foreigners’ claims on U.S. dollars, President Nixon suspended the convertibility of the dollar to gold (known as Nixon Shock). Since then, the U.S. dollar (and other currencies) has been “floating” without gold backing. 1971 was the beginning of a wild expansion of fiat currency and not to forget, fiat credit. Gold Can be and Has Been Confiscated in the U. S.
Unknown to many Americans, the U.S. government has the right to confiscate precious metals held in a safety deposit box. In fact, President Roosevelt exercised this right in April 1933. Compensation in the legal tender of the government meant that citizens were paid the official price of $20.67/oz. Following the confiscation, the dollar was devalued by 40% and the price of gold was readjusted and fixed to $35/oz. According to the World Gold Council, there are only 163,000 metric tons (one metric ton equals 1,000 kilograms and is 10% heavier than the standard U. S. ton) of gold in circulation. This is just about enough to fill two Olympic-size swimming pools. At $1,400/oz, all the gold ever mined would amount to roughly $7.4 trillion, or less than one ounce of gold for every person in the world. Gold is measured in troy ounces. One troy ounce equals 31.10 grams, while a regular ounce equals 28.35 grams. The Profit Radar Report has been expecting to see a double bottom in gold around $1,250 – 1,300/oz. Click here for the most recently published free gold analysis on iSPYETF.com. Premium analysis of gold and the SPDR Gold Shares (GLD)is provided via the Profit Radar Report.